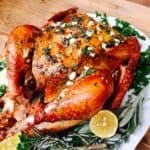 Garlic Smoked Turkey for Thanksgiving with fresh herbs is a delicious choice for any holiday that your oven is space challenged! 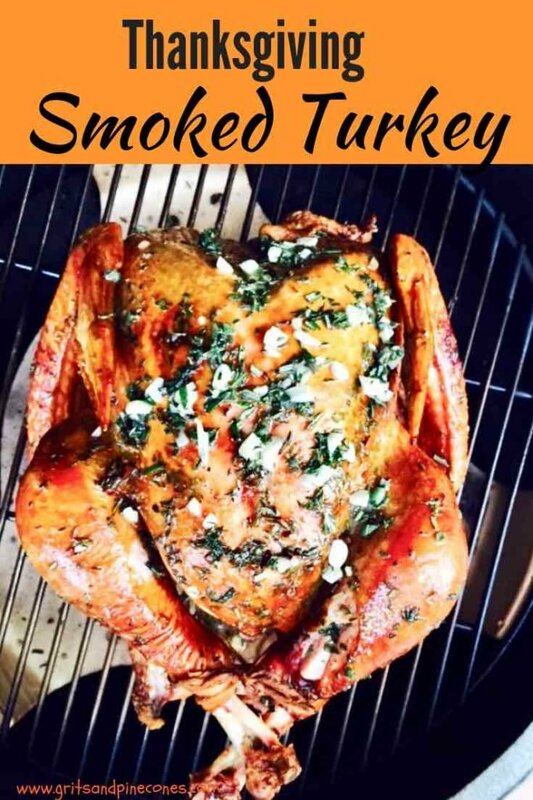 And, if you have never smoked a turkey before, you will be surprised at just how easy it is. Smoking a turkey is a great option for Thanksgiving or Easter, especially in the South and other areas of the country where the weather is still balmy. Also, smoking solves the puzzle of how to cook for a crowd when you have just one small oven. 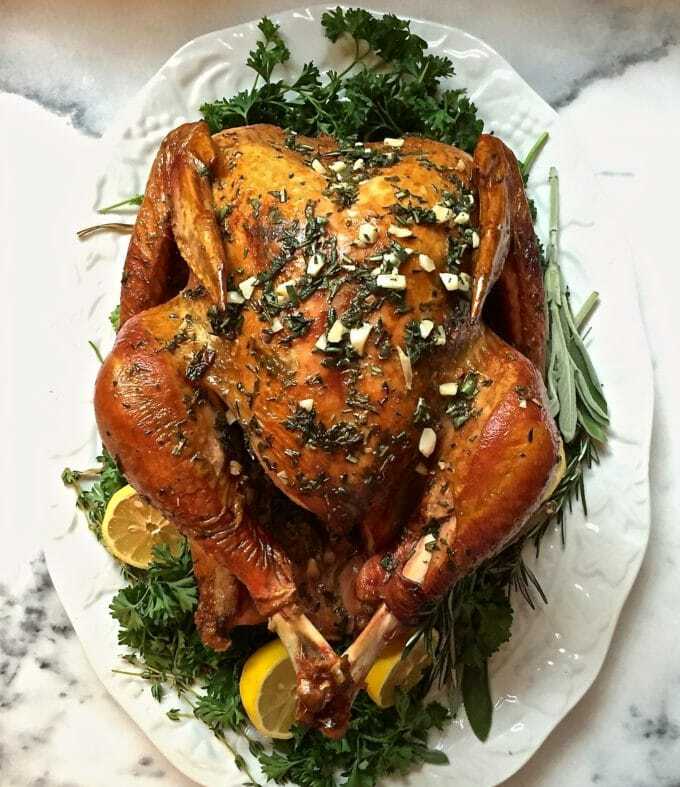 Garlic Smoked Turkey with fresh herbs for Thanksgiving also tastes and looks amazing! Smoking gives the turkey a deep golden brown color and the meat is moist and tender, with just a hint of smokiness. 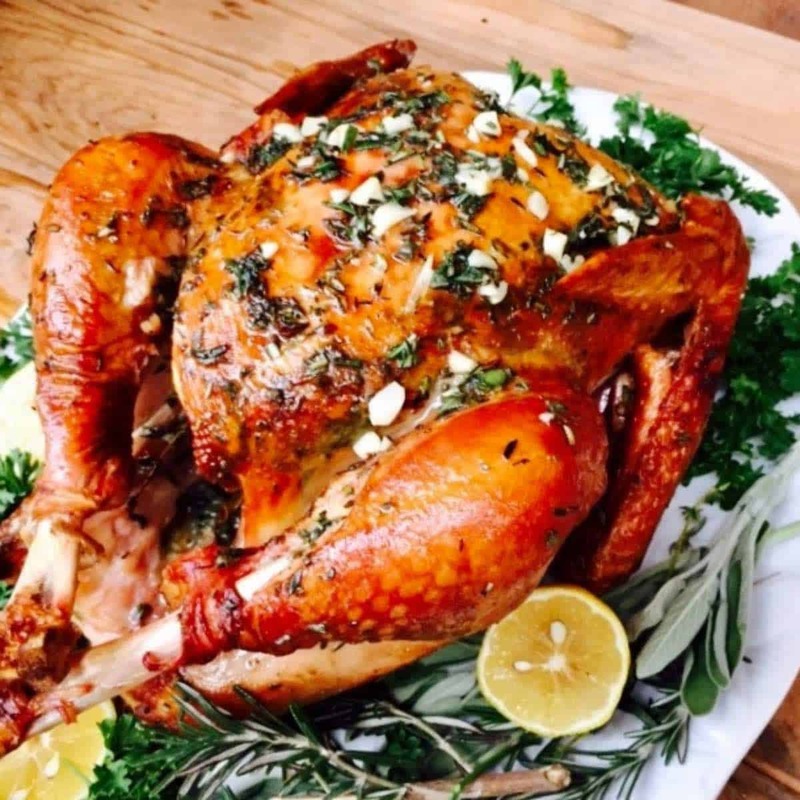 Garlic Smoked Turkey for Thanksgiving only calls for a few ingredients which are: fresh thyme, sage, rosemary, garlic, butter, lemons, kosher salt, and ground black pepper and the star of the show, turkey. 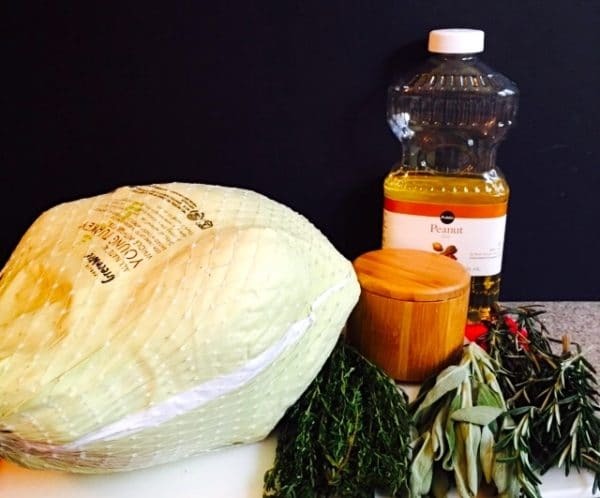 It’s not necessary to brine your turkey first, but if you prefer it, I recommend dry-brining, which is much easier than trying to submerge a large turkey in a bucket of water and then trying to figure out how to store it in the refrigerator overnight. Also, if you are going to brine your turkey, be sure to stay away from kosher turkeys, which have been pre-salted, as well as self-basting turkeys, which have been injected with a salt solution. If in doubt, read the label. To dry brine your turkey, remove the neck and giblets. Rinse the turkey under cold water and pat dry. Combine 1/3 cup salt and one teaspoon pepper in a bowl. Sprinkle all over the turkey and inside the cavity. Put the turkey in a large dish and refrigerate, uncovered, at least 8 hours and up to 3 days. The longer, the better. I know it seems strange to leave the turkey uncovered in the refrigerator, but it will help dry the skin out which will, in turn, make it extra crispy. When you are ready to cook the turkey, rinse well and pat dry. Set up your grill for indirect grilling and nestle a drip pan in the middle of the charcoal to catch the turkey drippings. Light the charcoal and preheat the grill to 350 degrees. 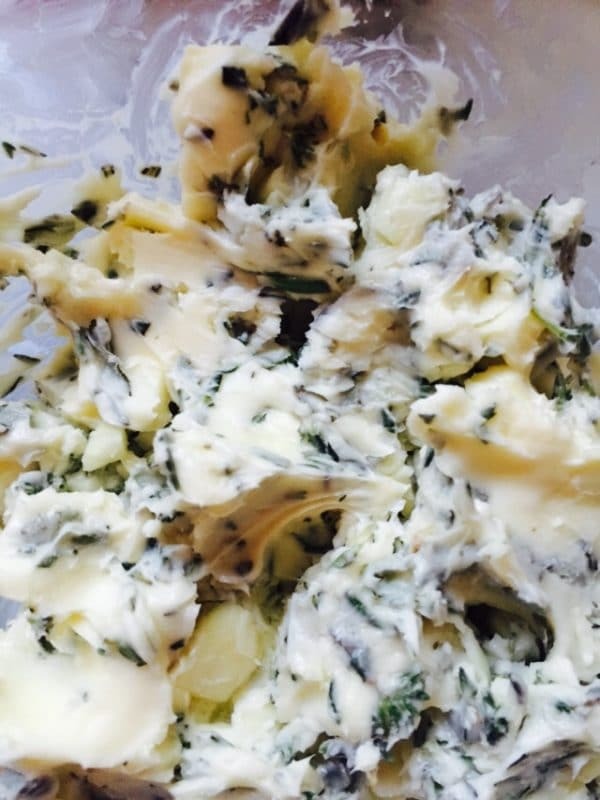 In a small bowl mix the softened butter with 1/4 cup each of chopped sage, thyme, and rosemary, and garlic. Sprinkle salt and pepper inside and outside of the turkey. Rub or brush half of the butter herb mixture over the entire turkey and loosen the skin over the breast so you can put some of the butter between the skin and breast. 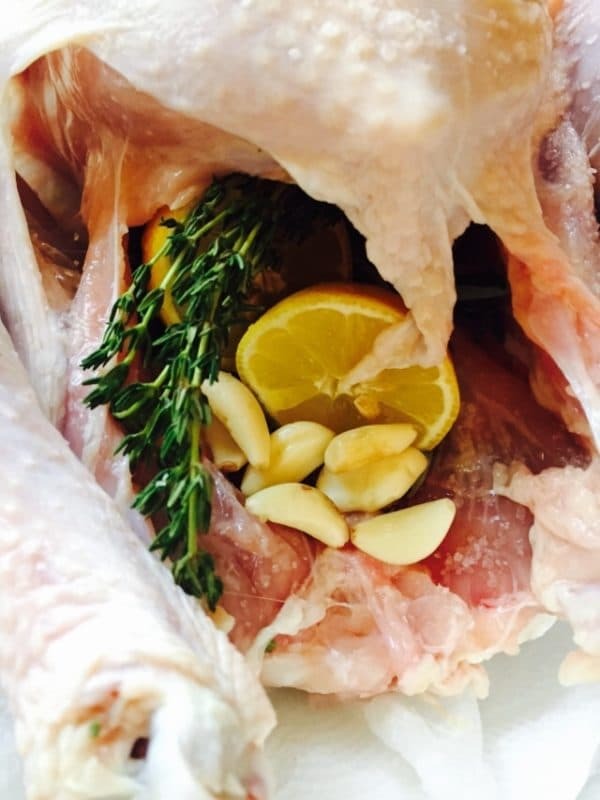 Place the rest of the fresh herbs and the lemon halves in the turkey cavity. Place the turkey on the grill. Cover with the grill lid or, if you don’t have a lid, cover the entire grill with heavy duty aluminum foil. Maintain the grill heat at 350 degrees (you may have to add additional charcoal) and plan to smoke the turkey for about 2 hours or 15-20 minutes per pound. 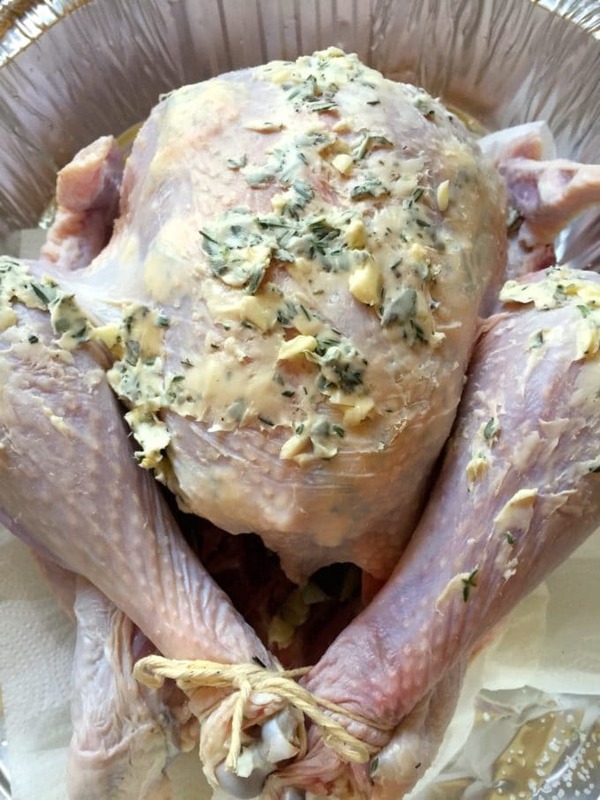 About every 20 minutes or so, brush the turkey with the herb butter mixture. 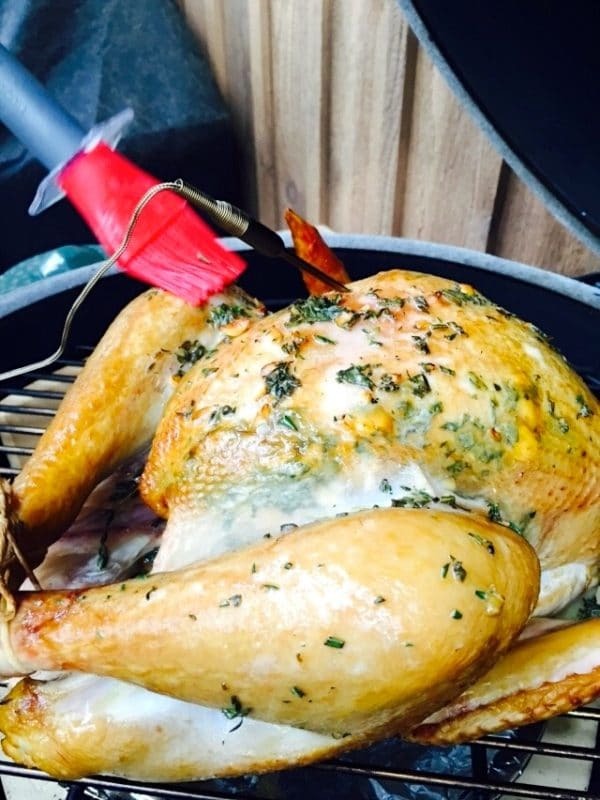 There are lots of variables when smoking a turkey, so use a meat thermometer to check for doneness. The turkey is done when an instant-read thermometer inserted into the thickest part of the breast registers 165 degrees F, or the thigh registers 170-175 degrees F. When done, move the turkey to a platter, cover and let it rest for 20 to 30 minutes before carving and serving. This Garlic Smoked Turkey for Thanksgiving tastes and looks amazing! Smoking gives the turkey a deep golden brown color and the meat is moist and tender. Yum! Sprinkle salt and pepper inside and outside of the turkey. Rub or brush half of the butter herb mixture over the entire turkey and loosen the skin over the breast so you can put some of the butter between the skin and breast. Place the rest of the fresh herbs and the lemon halves in the turkey cavity, and place the turkey on the grill. Cover with the grill lid or, if you don't have a lid, cover the entire grill with heavy duty aluminum foil. Maintain the grill heat at 350 degrees (you may have to add additional charcoal) and plan to smoke the turkey for about 2 hours or 15-20 minutes per pound. About every 20 minutes or so, brush the turkey with the herb butter mixture. 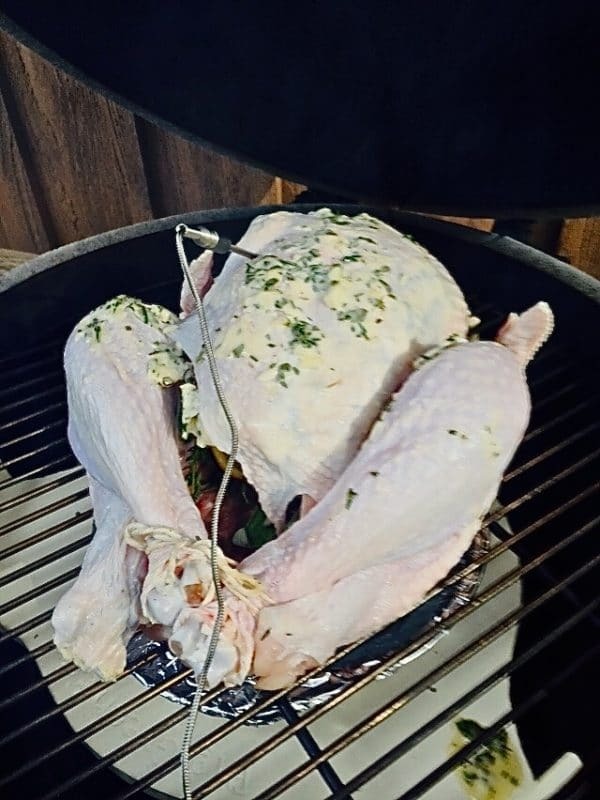 There are lots of variables when smoking a turkey, so use a meat thermometer to check for doneness. The turkey is done when an instant-read thermometer inserted into the thickest part of the breast registers 165 degrees F, or the thigh registers 170-175 degrees F.
When done, move the turkey to a platter, cover and let it rest for 20 to 30 minutes before carving and serving. We smoked our turkey with this recipe for about 12 hours last year and it was the moistest turkey we have ever had. The taste was great and the breasts of the turkey was so juicy. We did the dry brine route instead of a wet brine. Thanks so much for sharing Kim! I’m so glad you enjoyed it! Sharon…I can’t remember if I used unsalted butter or salted butter last year. Do you have a recommendation? We do the dry brine so I’m thinking that has enough salt in it along with the salt that is added later that I could use unsalted. Please let me know so I don’t get it wrong. Sorry to take so long to reply but I was out of town. I use unsalted butter in this recipe because I agree with you that with the salt in the dry brine, it would just be too much. Can the salting and covering with the butterand herb mixture be done the night before smoking the bird? I would definitely salt it and leave it uncovered in your refrigerator overnight. But I wouldn’t add the butter until you are ready to cook it. If you do, I’m afraid your skin might not turn out as crispy as you would like. Hope this helps and Happy Thanksgiving! I’m not sure how an electric smoker compares to a regular charcoal grill, but I would think it would be fine. And, the temperature should be kept at a consistent 350 degrees F. I hope you enjoy it and Happy Thanksgiving! Will t make a huge difference if we cover it in the fridge? I’m a little uncomfortable with the large amount of raw meat by my fruits and veggies. The skin of the turkey just won’t be quite as crispy. You could just cover it loosely with a piece of wax paper or parchment paper where the air still could circulate around it if that would make you feel more comfortable. And if you just can’t bring yourself to do that I still think you would be fine and the turkey will still be delicious! I was wondering if we can place the Turkey in a pan on the smoker? I would follow the directions that come with your smoker. But I would guess a pan would be fine. You might want to put a rack in the pan so that the turkey will cook evenly. Do you think I can cook it in the oven? I’m excited to try this!! I have a gas grill or to use my oven. Which do you think would be better? If you have the choice and the weather is nice where you are, I would go with the grill. Be sure to put a small aluminum pan in the coals under the turkey to catch the drippings to it won’t flare up. You could also do it in the oven, but you will not get the smokey taste. Hope this helps and hope you enjoy the turkey!